i felt rather like cycling for a few days and then spending the last days in the big city than the other way round. so i took a train out of melbourne to frankston and started cycling to sorrento from where the ferry to queenscliff starts across the port phillip bay. there was such a heavy wind that i was already thinking about taking another train to the other end of the great ocean road. as combined with the narrow road it became a safety issue. after talking with some locals who expected the wind to subside within the next days i stayed for a night at the caravan park in breamlea. i had a nice chat with the lady who manages the place and in the morning i was pampered with coffee and breakfast and didn’t have to pay for the site. 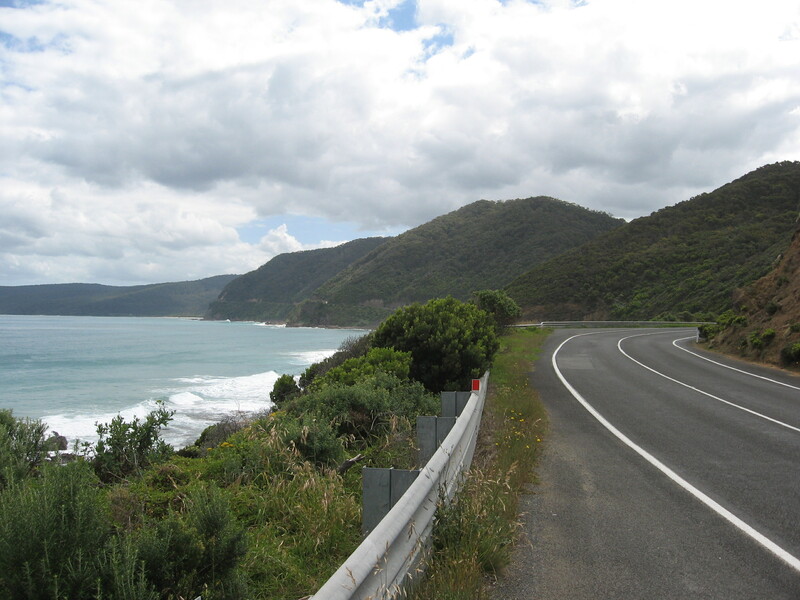 whoever is planning to cycle the great ocean road is well advised to do some research online as the tourist information doesn’t seem to know about the cheapo or free camping spots along the way. the caravan parks in breamlea and peterborough offer a discount for solo travellers. 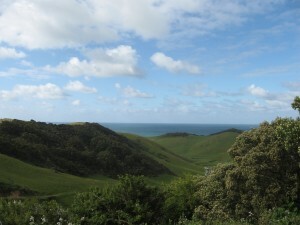 not the whole distance of the great ocean road offers a view of the ocean. 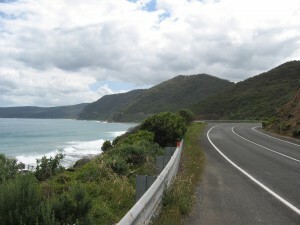 but especially the part south of lorne is going directly along the coast and offers wonderful views while riding. after spending the night at johanna beach and quite a climb in the morning to get back to the road, i was rewarded with this view. it was only a short climb from here to lavers hill, the highest point of the great ocean road. from there it is mostly downhill and then only over rolling hills past the places of interest which are responsible for the the international reputation of this coastline. the twelve apostels, the arch and the london bridge being the most famous. after 20 days of working and one week on the bike, i finally had a rest day in peterborough. now i’m on my way back to melbourne. a flight is booked for the 5th of december to christchurch on the the south island of new zealand.